Fri. December 15, 2017….Its been a while since I last posted. But catching up this week, we had a great fall of fishing and winter fishing is here, even if its not officially winter yet. Or at least that is what the calendar will tell you. December 21 is first day of winter, and also the shortest day of the year in our hemisphere…hence the name “Winter Solstice.” But I look at that as something created by man….its just a date, just a suggestion…not fact. Just like so many things. Truth is, we’ve had winter for some time. We had deep winter this week….and I have been out in it everyday. I had a trip scheduled for last Saturday, and ended up postponing it….due to heavy snow in the area where we were headed. 14 inches of it, high winds, temps in the 20sF. We elected to do another day. I’d have done it , but not everyone’s cup of tea to spend hours driving in it, hours fishing in it, then driving back in it. I do it all the time, have done it all the time. It makes memories for sure and caught lots of fish doing it. Big fish. Great week of fishing though. Started Monday 12-11-2017 guiding a friend and longtime client Ted Linczak, Summerville, SC, and our plan was to fish the TN tailwaters and find some dry fly fishing and then also do some floating and throwing some streamers. Flows were reduced to the point (465) that we had decidedly more of one than the other and we opted to do all wading instead. We also had more cold and snow, lots of snow in the high country, it started out really cold, and was chilly all day but bearable. We had hoped to get in some dry fly fishing, and expected to get in some in the afternoon with some olives, but we had rising fish right from the start. We caught fish on bwos, my cdc sparkle emerger, then caught a few on dry dropper rigs with midge droppers. Then we switched back to dries and nailed a ton of fish , it was game on all afternoon….the dry fly fishing was so good we never stopped for lunch. It was incredible, as good as it can be in the summer. Ted probably landed 50 or more on dries, a lot of them quality browns. When the sun started sinking low at 445pm, we switched over to a double nymph rig, a tunghead caddis larva with a spawn fly fished below it. Netted another twenty or so, many quality browns on the rig too. We fished til dusk and called it a day….it was a phenomenal day. There was more snow forecast for Tuesday, a quick shot clipper system, and I thought things could be interesting. Calling for cold and wind too, definitely ran most folks off the river. Not us. On Tuesday 12-12 definitely more cold and snow in the forecast…and that is exactly what we got. Bitter cold, wind, driving snow and sleet, a bitter raw day and only one other person one entire section of river we were on and he only stayed 15 minutes. We fished to rising fish from the time we got in the water at 845am til the time we quit around 415pm. So good we never stopped for lunch. Either day. 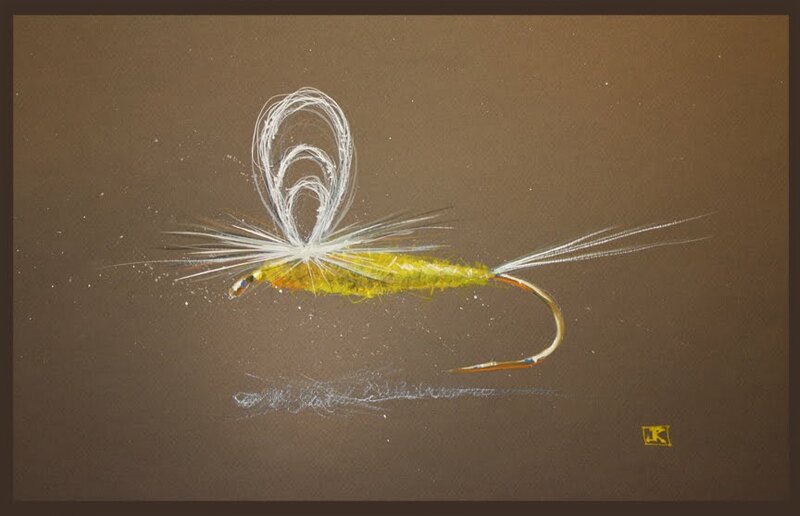 It was outstanding dry fly fishing ….bwo spinners and then a blanket bwo hatch. At least 50 fish in the net and all on a couple of my tiny dry fly patterns….a CDC blue wing skinny and a CDC Sparkle tail. A great day to be sure. After fishing I headed back through moderate to heavy snow most of the way back. Quite a nail biter in traffic towing a boat… Another big shot of snow and cold for the mtns (East TN, SW Va, and NW NC). On Wednedsay 12-13-2017 I guided a trip with longtime friend Brad Ball, Greensboro, NC, and we fished the NC Mtns, another bitter cold night and cold day today, overnight snow and temps were really chilly. Areas that didn’t get more snow last night (much of our mtns did) already had up to a foot/14 inches in spots. Couple all that snow lying around, temps in the teens and 20sF, and a stiff wind and it was really cold, ice in the guides, and on the rod tip such that you had totally quit fishing and deal with the ice. Fortunately where we were a lot of the snow nearest the river had melted…which put water that was barely above freezing in the river. We still caught plenty of fish. We fished double nymph rigs, and where we fished is stonefly water and among our favorites as far as nymphs is a 20 Incher Stone nymph….plus other stonefly nymphs…simply put they work. We used a variety of caddis larvae, midge droppers, and eggs and spawn flies. Put probably 35 or so in the net, we fished til 330pm and called it a day as it was getting really chilly again. Caught rainbows and browns, and some of the rainbows were fantastic. A couple were really nice fish. Good day in some not so great temps but hey, its winter right? A lot of the best fishing people miss because they don’t want to try it in the cold. Those who do try it are surprised shocked to learn how good it can be. The standard response …”I had no idea….”. On Thursday 12-14-2017 I guided Trip, Steve Krasicky, Greensboro, NC, and his client Tiaan Kruger, and for Tiaan, who is from South Africa originally but who lives in Raleigh now, it was his first time fly fishing. After stopping at two different spots and finding perfect winter conditions totally frozen conditions —we moved on to plan C. I mean where I’d planned on fishing was frozen bank to bank with the only free flowing water in the fastest riffles. So we went on to plan C and it paid off. We found some clear water, enough ice free to fish and did very well. We nymph fished all day, as you’d expect on a day like today for the most part , at least on a small stream. We had cold temps, snow on the ground, a stiff breeze at times, but we put in the effort and were rewarded with over 60 fish in the net. Landed several large rainbows over 20″….. Tiaan’s first day was a success I’d say, as he landed 36 fish and hooked or played many others that got off. That’s a great day anywhere. Fishing has been good the past week and today was no exception…..and as most of the week we had the water totally COMPLETELY to ourselves. Want to learn how to successfully fish in cold weather? I can show you how….We have a good many openings coming up…let’s go fly fishing! Have another icebox trip guiding longtime client Jim Kramer for tomorrow ( 12-16) and we’ll hopefully still have clear water to fish. Looks like a brief mild up, if you can call it that, so a lot of that snow will be melting hopefully. That provides our water flows during dry or really cold spells and for that reason I’ll never complain about snow. We need it, it does a great job recharging groundwater. Have a great weekend…..Merry Christmas! Mon. Aug 21, 2017 ….Just returning from Wyoming after two weeks out there. It was just as I left it last time. Wild. Wild as ever. Always amazes me even after over 25 years of spending a few weeks out there every summer its full of new experiences and surprises. This trip was no different. Well, it was a little different. In two respects. One, I did a different type of trip focusing on wade fishing several areas I know of and have fished for decades. We covered a lot of ground. 2700 miles worth in fact, most of it through wilderness areas miles from civilization and any paved roads. It makes you realize how many wide open wilderness spaces we have. Don’t let anyone tell you otherwise. We have plenty of wilderness. Two, I did the trip without the backcountry horsepack part of it. As some may recall, the outfitter Josh Roth, friend and fellow guide/outfitter that I did trips with for the past decade died tragically in an avalanche back in February. An expert snowmobiler/pro rider with Rasmussen, Josh spent a lot of time in the backcountry and in the snow. We had record snows this winter, and a brief warm period followed by some rain destabilized the snow pack in many areas causing a record number of avalanches. One of them claimed his life. It was tough in that respect doing it this year without him. He is terribly missed. A great friend and guide, and he was a favorite of my clients. We covered a lot of ground, here is a brief breakdown of our trip…..on the trip with me were Ted Linczak, Summerville, SC, and Dr Pat Burney, Greensboro, NC. Here is how our trip played out…. fished on the Jakey’s Fork and caught a few, then moved to the upper Wind R , which is also the Bighorn River (becomes it below Riverton) where we got into a good many Yellowstone cutthroats. Good dry fly fishing, landed about 30 cutts, one rainbow, one brown, one whitey. It was nice but we remained in a daily thunderstorm pattern and today would prove no different. Great fishing between downpours. Chilly as well when the clouds were over us, warm and nice when they weren’t. Had a great dinner at the Rustic Pine Steakhouse with a Wyoming steak…..the real deal. Great end to a great day. Fly of choice was a Hippie Stomper, a cuttie favorite. Did some high mountain lake fishing for cruising cutthroats , we fished one lake right at the tree line and caught a few nice cutthroats on midge pupa and wooly buggers. 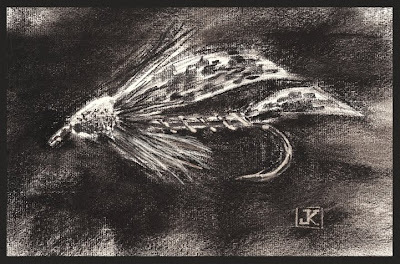 There were a ton of cruising fish, some of them we caught fishing deep with a sink tip line and wooly bugger, a fly I have used for years called a Jeff’s Favorite…basically a weighted wooly bugger with a black pearl krystal flash body. The cruising fish we caught sight fishing them with the same midge pupa patterns I use on the South Holston and Watauga. If you could see a cuttie, cast ahead of him, we were getting almost every one that was accurately cast to. We then ended up taking a lunch break, and fished a high meadow stream in grizzly country (didn’t forget the bear spray) near Togwotee Pass, a small stream that tumbles off the meadow at around 10000ft. We had great fishing, even some rising fish, as the weather was uncharacteristically cloudy and cool and we got a Baetis /BWO hatch. Killed them on dry flies, caught a ton of fish and Ted the best one, a 17″ brightly colored Snake River Finespotted Cutthroat. We probably landed over 60 fish total and then hit one more spot, a different stream that comes out of Brooks Lake….a well known and fantastic cutthroat lake that lies right in the middle of grizzly land. With fading light we managed about a half dozen brook trout and one nice cutthroat and missed a couple of others. All on dry flies no less….. Ended up having a great meal at Cowboy Cafe in Dubois, WY, where some Blackberry BBQ Ribs and Country Fried Steak were the specials….and they were great. Weather was all over the place, nice and warm /sunny interrupted with chilly, windy , and wet periods. Weird weather for summer in Wyoming, even more when its in a high mtn desert like we were fishing in. Best flies were the Hippie Stomper, a tan Schroeder Para Hopper, and a double Adams rig with a 12 point fly and 18 rear fly. Had a hearty breakfast Village Cafe and then headed up to fish the upper East Fork of the Wind drainage, an area I love for its remote location and very unusual beauty. It flows between the sagebrush covered mtns and hills to the southwest and the painted hills (red sandstone cliffs) that mark the beginning of the Wind River Indian Reservation. Once again we had great fishing fishing a small and little known trib of the East Fork of the Wind near Shoshone National Forest. The fishing was lights out, fantastic, with tons of quality fish up to 22.5-23 inches. Again, it was all dry fly fishing, every good pocket and run held a fish, and it was all Yellowstone cutthroats. Ted won the numbers with somewhere between 30 and 40 fish while Pat landed the largest one, a fish of 22-23 inches. Again all dries, it was stellar. We ate a late lunch, then headed to the upper end of the stream and caught a few more cutthroats, some good fish up to 16″. A downpour that was visible from a distance had dumped a good amount of rain on the headwaters and the water began to get incredibly off color. Eventually it turned dirty/muddy. We then hopped back in the SUV and headed back down to where we were but by then the dirty water had made its way downstream effectively ending the great fishing we had experienced. We ended up getting in the SUV and heading over to the headwaters of the Buffalo River, getting in a fishing a one mile meadow stretch. Fishing was great here, we landed another 25 to 30 fish or so. The Double Adams was the rig. Todays best flies were the Hippie Stomper, Adams Parachutes, and small red and tan para hoppers. We had another outstanding dinner at Nostalgia Bistro Restaurant , topping off a good day with a great meal. After a hearty breakfast at the Cowboy Cafe, we headed out to fish the forks of the East Wind. Overnight we had some heavy rain so when we got to the river it was up and wading was a little tough. We fished a 3/4 mile stretch and landed several cutthroats, a brown or two, and several whiteys (whitefish). Decided to look at Bear Creek and it was high and dirty, as well as the Wind and East Fork of the Wind. We ended up going back up to the Brooks Creek and caught a few brook trout, then over to Blackrock and caught a few cutties….all on dry flies again. We had good fishing all the way to about 8pm. We left and decided to go have dinner, a great dinner at Grizzly Grill. Excellent again as we had steaks and salads…pretty good stuff after a long day of fishing. Best flies again today were the Adams, also caught a few on hoppers. We rose early, and headed back to Jackson where we ate a great breakfast at the Virginian. Then we headed down and did a 25 mile trek across the Green River valley and fished about 2 miles of water on one of the Green River tribs in the Cottonwoods that flows out of Bridger National Forest. We caught a few cutts and brook trout on Hippie stompers, para hoppers, Adams, and PMDS. We fished til about lunch time and probably landed 15 fish, then headed over a few miles to the other fork and caught one cutthroat. Fishing was a little slow there, very suprising given the good fishing we found the day before. So we headed back to where we started and almost right away got into more fish, including several nice cutthroats and a bunch of smaller ones.. probably landed 35-40 total and Ted with the nicest one at 16″. We fished til about 7pm and called it day . One additional highlight was the moose we saw in the meadow where we were fishing. Saw lots of antelope as well, and they were all over. I don’t think there was a single day we didn’t see some antelope. Enjoyed another great dinner at the Bear’s Den Restaurant at Daniel Junction, some of which included Pork Schnitzel….and I sampled the Grilled chicken tortellini which was excellent. We then headed back to Hoback Canyon where we were staying. Pretty good day, and back to awesome weather Im used to in WY. We got up bright and early, had a quick breakfast from the local market, then headed out to fish the upper portion of the same stream we started on yesterday morning. Fishing was way better this time, we landed a ton of fish, lots of cutthroats and a few brookies and all on dry flies again. Pat and Ted probably landed around 40 or more fish before we took a lunch break. The weather was great, the only hitch was the western hopper wind that was blowing to 25mph+ at times. But it didn’t bother the fishing, even if it made casting a little tough at times. We ended up hitting another lower stretch of the stream, and it was the same there. A good many fish and Ted topped it off with a stunning cutthroat of about 18 inches. We left there and headed over to the other fork of the stream and ended up catching another 20 brook trout on dries and a lone cutthroat. Same flies but the Adams was king today. Size 12 and 14 and occasionally an 18. Worked like a charm matching the gray “drakes” that were coming off. Had another great evening meal at the Bears Den at Daniel Junction and back to the cabin in Hoback Canyon pretty late. Ted packed up and had an early morning flight to catch. Ted and I were up at 430am and to the Jackson airport so he could catch his flight home. Got there without a hitch and then I headed back to put lunch together and get stuff together for the day’s fishing. Gas up the vehicle, make sure you have plenty of water/drinks, ice, etc. (normal must haves out here)…that was what I did daily. I picked up Pat at his cabin and we had a quick breakfast from the market. Then we headed up the Hoback Canyon for the day. We started out with some of the same dries that had worked all week and just as the Adams had performed all week it did a fine job again, netting Pat many nice cutthroats up to 16″. We worked our way through several slide areas where spring avalanches and mudslides had occurred, and in some places had to rock hop and work our way slowly through tangles of downed pines. It was like combat fishing, but we did very well. I think Pat ended up with between 30 and 40 cutthroats, all on dries. In most places the Adams or Adams rig worked well, and in places where we had a large fish rise and we’d miss him or places I knew there were some good fish we’d change to a Schroeder Para Hopper tan. More often than not we’d get the fish to eat, and caught a bunch of good ones on the Schro hopper. We skipped lunch and eventually headed back down, hitting some of the better holes again with a different fly. Pat caught a handful more, and nailed one fish that was in the 18 to 20 inch range on a black Mormon cricket….a fish that had earlier risen to the fly but that Pat had missed on the hookset. He got another shot and hooked the fish but it shot under the willow undercut and got into the tangle of roots and broke him off. Easily the fish of the day if it had come to net. On that one we walked back , took a shot at one more spot, then called it a day and walked back. Walked about 3 miles over rough terrain and I think we were both exhausted. Good day though, and we ended it with a good meal at the Branding Iron Cafe with fish and chips and a shrimp basket. Great day, flies of the day again were Adams paras and tan Schroeder hoppers. The black mormon cricket also caught several fish. This is an abbreviated report , mainly due to time and travel constraints. We also were “off the grid” to the point that most of the time we had no internet service, cell service, etc. We have ,many, many more pics on the main fishing reports page of the website here . You can also visit that report by clicking the link below…. A great trip, we’ll be doing two trips next year. If anyone is interested in joining me in 2018 in Wyoming now is the time to start planning. We start a year in advance with the trip and plan all year for it. 2018 should be another great year for sure. Have a busy week with some float trips, one on Tuesday with Dr Ken Karb, Greensboro, NC. We will be floating the New R for smallmouth. Wednesday and Thursday I have two TN tailwaters float trips, and Friday I’ll be taking off. Saturday I round out the week with some lessons. Great week in front of us, looking at a slight cool down midweek and some rain. Everything is pointing to a great fall. If we keep getting rain its going to be a great one for sure.